Welcome to the first post on our new French Kitchen Antiques blog. We will use this space in the future to give you more in-depth information on the history of antique French kitchenware, some of the stories behind famed manufacturers and of course updates about new antiques that we’ve added to our shop. We start out today with the Parisian firm of J. Jacquotot. We recently came into the possession of two lovely hand-hammered frying pans, which both bore a stamp that isn’t seen that often these days. It was of the Parisian company of J. Jacquotot. We’d heard of it before, but wanted to know more about its history so we set out to do some research. One of the two saute pans bearing the Jacquotot, Rue de Grenelle stamp. J. Jacquotot was a company that specialized in supplying the grand hotels, the restaurants and the kitchens of the great mansions of Paris from the turn of the last century. In the first decades of the 1900s they grew into one of the country’s leading suppliers of culinary equipment. 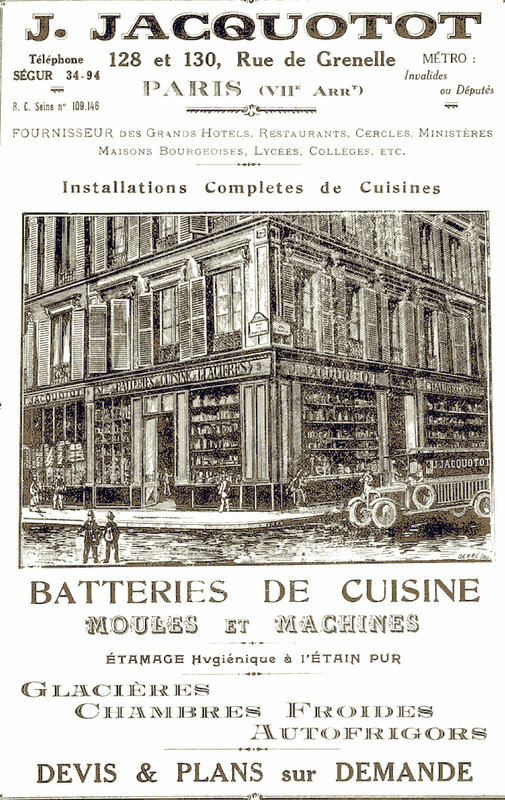 Their original store premises were located at 128-130 Rue de Grenelle, in the fashionable 7th arrondissement, which was the address engraved on the pans we had found. At a later date (we weren’t able to establish exactly when this happened), the company moved further away from the center, to 77 Rue Damesme, at the southern edge of Paris. Perhaps this was a sign of the decline in the fortunes of the company. The original Jacquotot store in Paris. Sontheimer was inspired by what he’d seen to re-release the 1925 catalogue of the J. Jacquotot company, which carried the entire range of products available for purchase at that time. We managed to procure a copy and it’s great to go through it and look at the enormous variety of items available. From dog-shaped ice cream molds to large ice boxes and even an almost six-feet high machine that could be used for beating 90 – 100 egg whites. Not exactly for the home chef. A handy machine to beat 90-100 egg whites at the same time. It could run on an engine or be powered by the kitchen help. And of course there was the copper section as well. On page 8 we discovered the pans we had procured, listed as a sauteuse évasée and a plat à sauter respectively, available in sizes ranging from 16 to 40 centimeters. You can find them at these two links provided, historic reminders of the esteemed company created by J. Jacquotot, supplier to France’s great kitchens and friend of a king. Page 8 of the 1925 Jacquotot catalogue showing the saute pans. Bonjour Peter ; je viens moi aussi de découvrir le site ; car depuis pas mal de temps je me disais ‘ il faut que tu regardes avec la gravure sur le côté qui est ce fabricant ‘ . C’est chose faite . Il semble que soit gravé aussi NORD ( Hôtel du Nord ) . Le diamètre est de 455 mm et la hauteur 150 mm . J’ai fait de la confiture d’abricots dedans fort bonne . Mais pour le nettoyage de l’intérieur je ne suis pas spécialiste aussi l’assemblage en forme ” d”étoile ‘ en cuivre recouvert en partie d’étain me pose problème ,Je ne voudrais pas faire n’importe quoi…..Est ce qu’il est possible d’envoyer une photo extérieur – intérieur ? Merci et bonne année . Grace à mon fils nous venons de découvrir votre site. Je suis l’arrière petit fils du fondateur (Jean-Baptiste Jacquotot). L’entreprise a été reprise par mon grand père (Alfred Jacquotot) puis par ma mère (Janine Jacquotot) mais à son décès à Pâques 2000, nous avons du fermer faute de client en nombre suffisant. Les restaurants et les grandes cuisines ayant modernisé leurs installations pour une plus grande rentabilité. Après la rue Damesme où nous n’avions plus le droit d’exercer (produits “toxiques” en plein Paris et nous avons été expropriés, nous nous sommes installé à Plaisir dans les Yvelines (à coté de Versailles). ainsi que les plaques en fontes du 1er catalogue. Thanks for your comment Marius. We’ll add you to any newsletters we send out. 5 sauce pans have turned up for auction from the Damesme address. Are they worth bidding on? 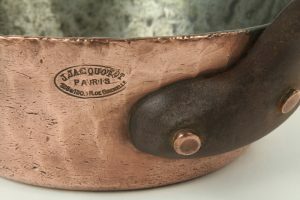 It’s hard to say without examining the pieces in person, as the quality of the copper and age of the pan have a large impact on the final price. Good quality pans can retail in the $300-500 range, depending on the size. (2) From your posting, it appears that (as of 1925), they were still there. However I have a Jacquotot gratin with a stamp showing a Rue Damesme location in the 13th. When did they move there, and was that the only other store location? Peter, I just found your Site and blog today, and it is fantastic! Please keep up the great research, and I hope you may consider adding a tab that is named “Manufacturers”, to archive information on these companies. Thank you! Hi Richard. Thank you for the comment. I’m glad you like the site and adding a manufacturers-tab is definitely something to consider once we get more content in the blog. Do you know if they ever stamped the hotel name on the pieces that were made for or sold to certain French hotels? 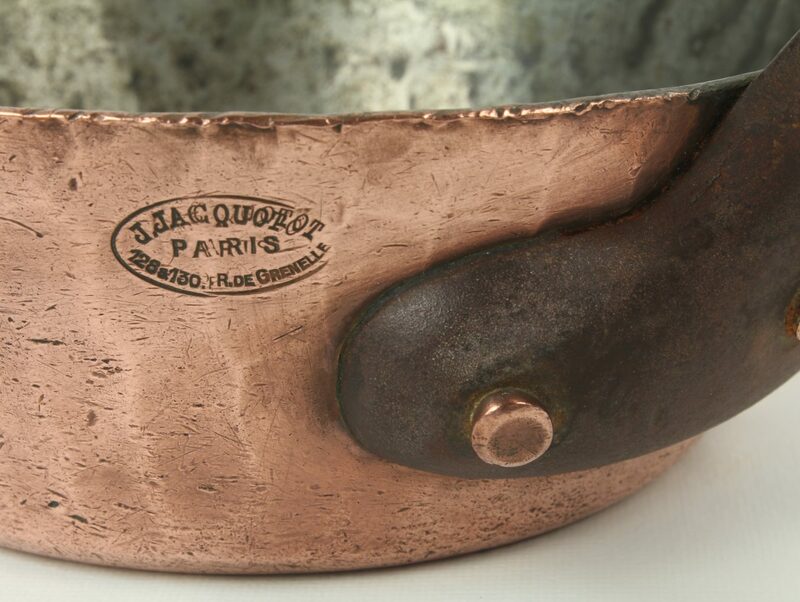 While I don’t know if Jacquotot offered this as a service for copper products bought from their store, I have come across plenty of copperware with hotel and sometimes restaurant names stamped into the pans. Initials are quite common as well. Fantastic research. Are you selling copies of these old catalogs? If so, I would love to acquire one. Thank you for the kind words. We don’t sell the catalogs ourselves, but you can find the occasional copy for sale online on sites like AbeBooks.com.